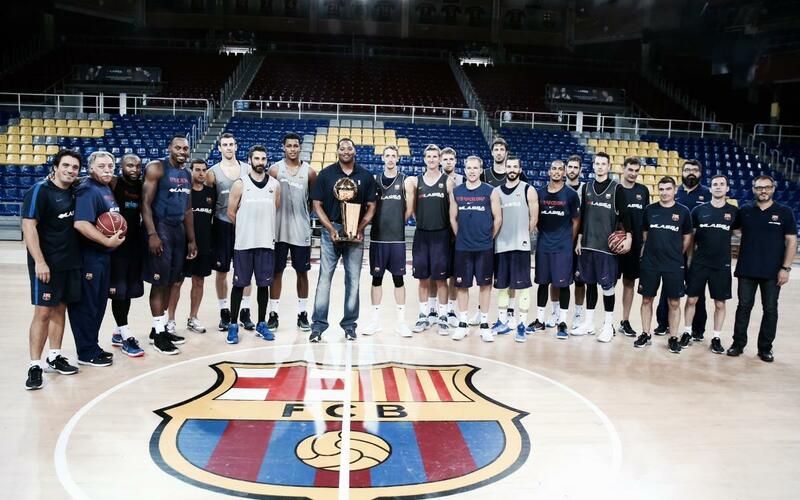 Robert Horry, who won seven NBA championships over a 16-year career while playing for the Houston Rockets, Phoenix Suns, Los Angeles Lakers, and San Antonio Spurs, visited the FC Barcelona basketball team’s practice session on Wednesday in Barcelona. Horry met the whole team and posed with the Barça players and coaches on their home court, the Palau Blaugrana, located adjacent to Camp Nou. Several players took advantage of the visit to snap selfies with Horry, whose seven NBA titles are the most in history except for eight players who played for the Boston Celtics in the 1960s. Barça big man Joey Dorsey, like Horry a native of Maryland, chatted at length with the former player. Horry is in town to promote Barça's October 5 game against the Oklahoma City Thunder as part of the 2016 NBA Global Games Europe. Tickets for the game, to be played at the Palau Sant Jordi in Barcelona, are on sale through Ticketmaster, here. Tip-off is set for 8.30pm CET. Horry will be in attendance at Camp Nou on Wednesday night when FC Barcelona host Atlético Madrid in Week 5 of La Liga.